About: (Back of the book) Whenever a bird flies into a window in Spring Green, Wisconsin, sisters Milly and Twiss get a visit. Twiss listens to the birds’ heartbeats, assessing what she can fix and what she can’t, while Milly listens to the heartaches of the people who’ve brought them. These spinster sisters have spent their lives nursing people and birds back to health. But back in the summer of 1947, Milly and Twiss knew nothing about trying to mend what had been accidentally broken. Milly was known as a great beauty with emerald eyes and Twiss was a brazen wild child who never wore a dress or did what she was told. That was the summer their golf pro father got into an accident that cost him both his swing and his charm, and their mother, the daughter of a wealthy jeweler, finally admitted their hardscrabble lives wouldn’t change. . .
My take: Rebecca Rasmussen’s debut novel is a delicate portrait of a family who find that life doesn’t always deliver what had been promised. The family consists of a mother who married beneath her parents’ expectations, a father who aspired to be accepted by people who never would, and the daughters who simply want their family to be the way they used to be. When cousin Bett arrives for the summer she seems intent on throwing everyone off balance – and she does. The story is told in the present and the past. 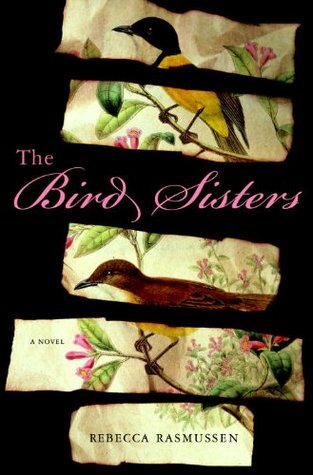 I was completely drawn into the novel and felt an ache for the sisters as they tried to fix their broken family, each other, and then the injured birds. Now that she was old, Twiss understood why people her age stopped speaking and started sitting on porches. Language failed to describe the simplest of phenomena; a fine sunset, for example, was more than fine. There were no words, or Twiss couldn’t find them anymore, for the way the colors made her feel. She’d say to Milly, “It’s an especially pretty one tonight,” when she meant that it reminded her of other sunsets, and years, and people who had nothing to do with sunsets: pinks and reds and blues. Reading this novel was like looking at a painting and with each glance discovering something new in the deceptive simplicity of it all. The Bird Sisters is the story of hopes, dreams, sacrifice, and the love of two sisters. This is one of those books which will have to go on the TBR. When I will find it is another matter but it eventually will get read. Wow, that book sounds really good! thank you so much for reading my book, Mary. What a wonderful review! Earlier this morning, I had placed this book on my TBR list. It was such a wonderful surprise to find your review of it only minutes later! I am really looking forward to reading it. This is the second glowing review I’ve read about this book this a.m. I am adding this to my TBR list. Ooh how beautiful. I can’t wait to read this now. Lovely review Mary. I’m so glad to see you loved this book, because I respect your opinion. I’m so excited for Rebecca! I so want to read this one so I am thrilled to see it is as good in actuality! This sounds like a beautiful story! I simply cannot wait to read it! Great review. This sounds like such a wonderful and delightful story. 5/5! Wow! I am definitely adding this to my wish list. Excellent review! I just read another positive review of this book, so now I’m really curious! I have to check this out. Now that was a lovely lovely review…I love short reviews like yours that say something!!! It is all I need to know whether or not this book is for me. This is number one on my wish list..I may have to sneak out and get it this week. This book sounds like a winner to me! I enjoyed your review. i’ve been following rebecca on twitter for a while and am so happy her book is making such a splash! she’s really involved in the online book community and i wish her much success! your review has convinced me to pick this one up! Gorgeous review! It’s a wonderful book. I’m glad to see another great review. I enjoyed it too and I’m soooo happy for Rebecca. I enjoyed this one as well. Nice review. Oh, I so want to read this! Wonderful review, Mary! I just saw another really positive review for this one. I will for sure have to give it a try. Have a great week! This sounds like such a touching read – I love your concluding paragraph about the book being like looking at a painting, what a beautiful comparison. I’m really looking forward to this book. I love books about sisters and I love this time period. I can’t wait to read this one. Oh my goodness…5 rating and your review has me wanting to get my hands on this one in the future!!! Nice review Mary. I really loved the sisters. They were characters that you couldn’t help but become attached to. 5 stars! Noting this one for 2011 reads and I think I’ll pick one up for my sister too. This sounds absolutely wonderful! And your 5 of 5 stars makes it doubly so! Heading off to put it on my to-buy list! Sounds like a fabulous book and hope to get a chance to read it.